Maximuscle Maxipower - Possible the best pre-workout formula ever! 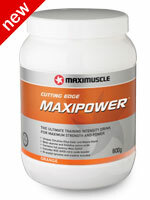 Maximuscle Maxipower - BACK IN STOCK! One of our customers (a retired professional climber) came into the shop and took every pot of our first delivery of Maxipower, following on from that, he ordered a further 10 pots to use between himself and his friends as they found it absolutely fantastic, especially for really long routes. That in it's self has got to be one of the best recommendations of all times for a supplement! Climbing = Strength, Endurance, Stamina, Focus. Covers pretty much most sporting requirements one way or another. Give Maximuscle Maxipower a go, we look forward to some great feedback! Possibly the worlds strongest pre-workout training intensity and strength increaser ever created. Maximuscle�s Maxipower (MP) is an exciting, new and innovative pre-workout formula designed to create the most intense training session you've ever experienced - workouts that are needed to trigger the muscle growth you crave. Or sporting performances that will help shatter personal bests. Each serving of Maximuscle�s Maxipower contains some of the most exciting, researched and talked about performance nutrients ever to hit the sports nutrition world. You should literally see and feel the formula working within minutes of taking your first serving. Mix one serving of Maximuscle�s Maxipower in 300ml of water. Stir or shake vigorously and drink immediately. Take 20-30 minutes before training.